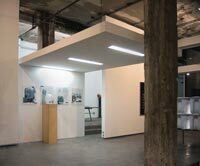 Paragraph is an artist-run non-profit exhibition space with a project-based curatorial program. We show emerging Kansas City-based artists, designers, and architects alongside mid-career national and international artists, designers, and architects working in a variety of media. Paragraph likes multi-disciplinary activity and work that connects diverse media, genres, and audiences. Ours is an inclusive sensibility that broadly engages the hybridized field of contemporary culture — an exhilarating mix of beer, art, and philosophy. We are eager to develop reciprocating links with like-minded contemporary art spaces located outside of the major art centers. Our programming includes traditional exhibits alongside screenings, performances, lectures, events, and other forms of public benevolence. Paragraph was founded in Lawrence, Kansas in September of 2003. After being forcefully ejected from our space just six months later, we reopened in Kansas City in May of 2004 as an Urban Culture Project. The Urban Culture Project is a non-profit that establishes visual art and performance spaces in vacant storefronts in downtown Kansas City. A progressive blend of Kansas City’s business and art communities, the Urban Culture Project aims to reintroduce street-level cultural vitality to Kansas City’s core, while highlighting the city’s contemporary art community. Artists participating in our 2004 Stray Show installation are Armando Diaz, Jill Noone, Eric Robertson, Seth Johnson, Cobi Newton, Eric Grimes, Miles Neidinger, Matt Wycoff, Cullen Stevenson, Peter Demos, Michael Jones McKean, James Woodfill, Oz McGuire, Adam Hinterlang, Josiah Dermyer, Jordan Nickel, and Hesse McGraw. New Forms of Constructed Space"